Appendicitis: Symptoms, Causes, Treatments and More! Knowing the symptoms and causes of appendicitis can help you diagnose it earlier and contact a doctor at the right time. Bonus, healing tips and more! Appendicitis can happen at any stage of life and is one of the most common ailments that usually targets juveniles and adolescents more than grownups. Men are at a greater risk of having appendicitis than women. Since the diet in western countries is not that rich in fiber, appendicitis is more prevalent in the west than in other parts of the world. It’s estimated that 6% of UK citizens suffer from this ailment during their lifetime. A large percentage of abdominal emergencies that require surgery in UK hospitals are caused by appendicitis. Although appendicitis usually occurs during the ages of 10 and 30, a person can get affected by it before or after this age as well. In the US alone, an estimated 250,000 appendectomies are carried out yearly for treating cases of appendicitis. So, it is vital for you to know causes and symptoms of appendicitis and how to heal it quickly. Appendicitis is the name given to the medical condition when the appendix inflates, gets infected and starts filling up with pus. 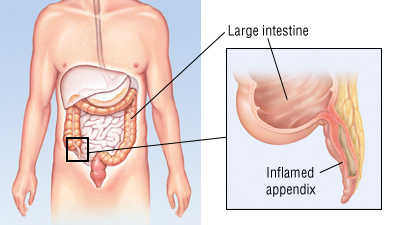 The appendix which gets affected in appendicitis is an elongation of the colon. It lies on the right side of the abdomen and is similar in appearance and shape to a finger. Scientists are still studying the exact function of the appendix. According to Charles Darwin, the appendix was an organ that was used by early humans for plant digestion. The latest research done reveals that the appendix is a safe haven for friendly bacteria which can help the body to battle with infection as well as to digest food. Blockage: Blockage of the opening to the appendix caused by pieces of waste or stool can lead to appendicitis. In such a scenario the bacteria existing in the appendix start to proliferate at a rapid pace, making the appendix swollen and filling it with pus. Infection: Gastrointestinal viral infections can also cause appendicitis. Similar to blockages, appendicitis caused by infections also results in bacteria buildup in the appendix, which if left untreated can end up rupturing the appendix. The most obvious symptom of appendicitis is pain felt on the right side of the abdomen. The pain usually starts in the belly-button and gradually proceeds to the abdomen’s lower half. Expectant mothers and children might feel this pain in other areas of their abdomen. This abdominal pain usually worsens if your body makes sudden movements like sneezing or coughing or getting jolted from time to time while sitting in a car on a bumpy road. Having a low-grade fever and feeling chills and shaking are a classic symptom of stomach bugs as well as appendicitis. If you are having stomach pain which is accompanied with a low-grade fever about 100 degree F, then it is probably a stomach bug.However, if you fever is above 103 degree F and your stomach pain is making it difficult for you to even stand properly, then it is probably appendicitis. Another symptom of appendicitis is loss of appetite. When your digestive system doesn’t work up to its full capacity, you would start feeling unwell and have poor appetite. If this condition lasts only for a day then you don’t have to worry, but if it lasts for more than two days then it is an indication of appendicitis. Nausea and vomiting are also signs of appendicitis. You might not experience severe vomiting or nausea at first but the two symptoms would persist for more than a few days and would start to get worse as time goes on. If the vomiting and nausea you are having is accompanied with fever and abdominal pain, then you might have appendicitis. Having mild diarrhea or constipation is also among the symptoms of appendicitis. If you find mucus in your diarrhea then it is a clear sign that you might be suffering from appendicitis, especially if you are simultaneously having pain in the right side of your abdomen. Inability to pass gas is also an indication of appendicitis. If you have been having difficulty in passing gas for more than two days and are feeling bloated at the same time then you might have appendicitis. Contact your doctor immediately if you start feeling the signs of appendicitis. An inability to stand or sit properly because of severe abdominal pain is also a sign that you should make an appointment with a doctor. Appendectomy is the procedure prescribed for treating appendicitis. It involves the removal of the appendix from the body. Both traditional method of incision and laparoscopy are used for performing appendectomies by surgeons. You would have to stay in the hospital for about 2 to 3 days following an appendectomy. Limit activity: It is better to avoid taking part in any sort of physical activity for about 3-4 days after having a laparoscopic appendectomy and about two weeks for traditional appendectomy. Pay attention to your abdomen: Keep a pillow over your abdomen when coughing or laughing or making any such movements to reduce abdominal pain. Have enough sleep: If you feel tired and sleepy, then relax and sleep for a while, letting your body heal by itself. Distract your mind from the pain: To minimize the symptoms of pain, use distracting activities like having a conversation with a friend or listening to your favorite song. You will focus on other things and you won’t feel much pain. Contact with your doctor whenever you meet problems: If your pain does not go away and keeps on troubling you, then contact your doctor and ask him to prescribe medication to you. Why Do You Nausea Sick Following Meals? Having nausea after eating? It indicates your intestines or digestive system is suffering. Why does this happen? And how can you get some relief? What Causes Dark Green Stool? How to Deal with It? Can Bananas Help with Constipation? CopyRight © WWW.MD-HEALTH.COM. Last Updated 22 April, 2019.